NSPE and the Professional Engineers of Oregon are urging state legislators to oppose a bill that would enable commercial interior designers to engage in the practice of engineering. The bill (H.B. 2153 ), if enacted, would permit commercial interior designers to practice engineering if they have completed a voluntary certification program. 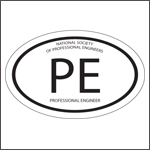 In the letter to the cochairs of the Oregon Joint Committee on Ways and Means, NSPE President Kodi Verhalen, P.E., Esq., F.NSPE, and PEO President Matthew Cash, P.E., state, “The professional engineering licensure process, and the verification process by the State Board of Examiners for Engineering and Land Surveying of those deemed to meet the basic education and testing requirements to train in the practice of engineering, demonstrates an engineer’s qualifications and commitment to the highest standards of engineering practice. We urge you to oppose H.B. 2153 and any legislation that exempts professional engineering licensure for the practice of engineering as defined by the State of Oregon.” Read the full letter.